Nalan Kumarasamy shot to fame with his very first Tamil film Soodhu Kavvum (2013). He also shot a crucial segment in the collective film, X: Past is Present and is now back with his second Tamil film, Kadhalum Kadanthu Pogum (love shall also pass too). Produced by C.V.Kumar and K.E.Gnanavel Raja, this is an official remake of the Korean hit, My Dear Desperado (2010). Interestingly the Hindi version of the same, Jayantabhai Ki Luv Story (2013) was not well received. 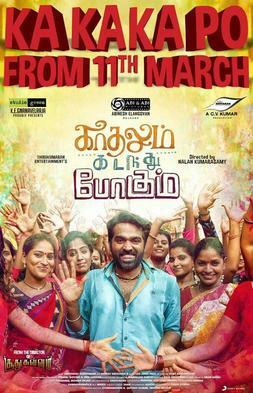 Kadhalum Kadanthu Pogum or Ka Ka Ka Po as its also referred to features Vijay Sethupathi in the lead along with Madonna Sebastian of Premam fame and Samuthirakani. The film has music by Santosh Narayanan while Dinesh Krishnan is the DOP and Leo John Paul is the editor. The film is due for release on March 11, coming close on the heels of the recent Vijay Sethupathi film, Sethupathi. Check out the trailer for now.